This is my second post of purchases for the month of January…I may have gone a little crazy during those great after holiday sales, so I’m anticipating shopping much less in February. 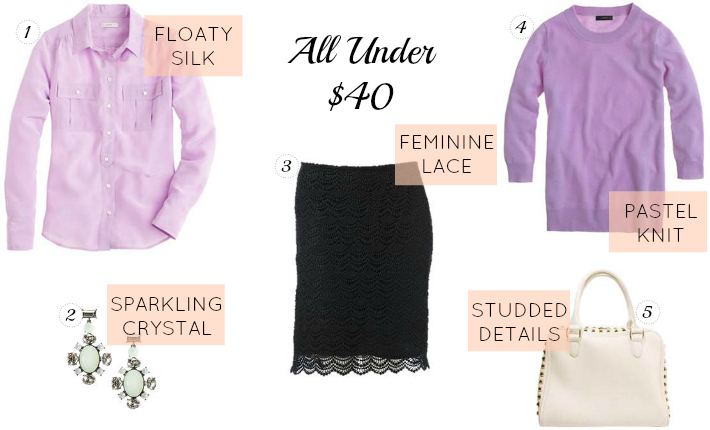 But, I was thrilled to find two basic pieces in my new favorite spring hue (lilac) and a few items I’ve been wanting for a while ~ the perfect lace pencil skirt (which I plan on wearing like this), a white handbag (love the Prada-esque shape) and statement earrings (much less than this J. Crew version I was stalking). can't WAIT to see the lavender outfit you come up with! i know it will be amazing!!! Digging those Simply Vera Earrings, they are a great alternative to a more expensive version I am lusting after at J.Crew. It has been darn near impossible to resist the sales! I went way over budget this month, but hopefully feb. will be better! Love the studded purse you picked up, so gorgeous! Numbers 2 and 3 are my favorites! I just did an outfit featuring lavender. What a beautiful color. Love your picks and deals. 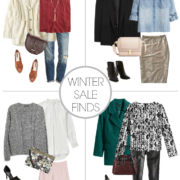 Great time to take advantage of these great winter deals. I too am totally loving that inspiration photo. Not only is the skirt great, but the belt is to die for, and the bracelets are lovely. Can't wait to see how you put it together! So sorry! I have no idea why this ended up on here twice! Love it all! I love the lavendar and that skirt is amazing! Can't wait to see how you pull it all together. Wish I had your sensibility when it comes to shopping – yo always seem to make the best purchases and I can't wait to see the outfit with the lace skirt. Wish I could have gotten my hands on that silk blouse.I love your blog! LOVE the lilac – great idea for spring! Pastel colors are back again this year, right? Love the earrings! Kohl's is my hidden gem for great finds. I went a little crazy too. Yikes. I love that lace skirt and the studded bag. So cute!! I can't wait to plan a trip to F21 so I can stock up on some awesome stuff. I just got a similar lace skirt from Banana (also on major sale). I'd be curious to see some ways to style it for a "business casual" office environment if you don't mind! I love how the forever21 item is the most expensive. It's usually quite the opposite! PERFECT pieces! I swear you are a girl after my own heart! Can you please share the 30% off Kohl's coupon? love the lilac/lavender tops you got! so pretty! Unfortunately the 30% off coupon was for last week & has since ended. However you can use code EXCLUSIVE & get 20% off your purchase (ends tomorrow). Love the skirt! This post could be an outfit in itself! Looks like you have had a successful shopping trip! Can't wait to see the items on. I especially love the lace skirt! Love. The. Skirt. Ordering now! I love the lilac blythe, sooo pretty! Also really loving that skirt, can't wait to see how you style it! I'm so in love with the lace skirt….how lovely!!!! Love that lavender color, so pretty and feminine! Great finds! That pencil skirt is gorgeous. And I know what you mean–the 40% off sale at J. Crew after Christmas almost killed me. that purple color is so beautiful! Fabulous purchases! A new lace skirt is definitely on my WISH list! I actually have two of the Blythe shirts (in different colors) – one of them is the regular size 4 and one is a tall size 2…the only difference is the tall is longer in length & the sleeves are longer. Just for reference, I am 5'8". Hope that helps! !